Envirocare members met with facilitators from Terrain NRM to brainstorm and workshop ideas for the future activities of Envirocare. 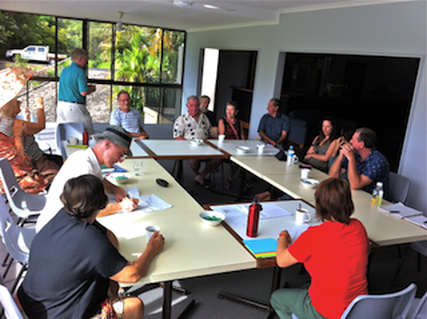 Several key points were discussed such as establishing a walking track through the plantings along the Barron River, being proactive during Mareeba Shire Council's development proposals, continuing the monitoring of bird use of planted areas and ways of educating the public on Envirocare's work and achievements. As this was a pilot event for both Terrain and Envirocare, follow up meetings will be conducted to flesh out ideas and arrive at definite priorities for the Strategic Plan. The results of these workshops will be published in the future.